This entry will be a bit short as I race to pack and get ready to head up to NY tomorrow morning for the marathon. My illness last week turned out to be a sinus infection and not the flu, so that was good news. It still knocked me out for about 5 days - I didn’t leave my place much. Even though I was already in tapering mode, when my training schedule suddenly ground to a stop for several days, I started to worry if I was ready for the race, and if I’d be healthy enough to race. On Wednesday evening I went out for a run in the VFFs. The route was just over 6 miles through Columbia Heights, Adams Morgan, and Cleveland Park. There were a couple smaller hills on the run, and one long hill up Porter Street from Rock Creek up to 34th Street. The shoes feel more ‘normal’ each time I run in them, and some of that awkwardness around my right pinkie toe is gone. But I wouldn’t wear them for anything other than running, flip flops or sneakers are still more comfortable and easier to coordinate with. With all the rain recently, the route was pretty well covered in wet leaves. I didn’t slip at all during the run, and found the shoes hold the ground as well as any other running shoe. On some of the steeper downhills (where my feet land the hardest) I felt some tenderness on the soles of my feet and toes. It wasn’t painful and I didn’t need to stop or slow down, but it was the first time running in the VFFs where I found myself wishing for a bit more padding under my foot. I think I mentioned in an earlier post, I find that on hills you most feel like you’re running completely barefoot. 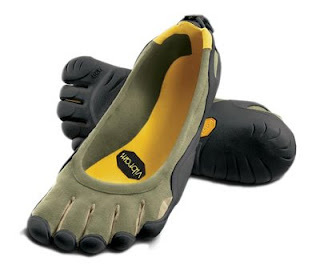 My unscientific theory is that on an uphill you stay mainly on the balls of your feet, and because there’s so little shoe in the VFFs you don’t feel like you have quite the same center of gravity that you feel in a traditional shoe. I’m sure all of this goes away the more you run in them, although my mom’s physical therapist is skeptical. He says you can’t change how you run when you’ve run one way for your whole life….We shall see I suppose. So anyway, back to my run on Wednesday, I ended up finishing up at 8:09 pace, which I was pretty happy with, especially considering the hills. On the flats in the last couple of miles, I definitely felt like I was moving. I don’t feel like my speed is any slower running in the VFFs than in my old running shoes. Next week I will be recovering from the marathon. Oh, I should mention I’m not running the marathon in the VFFs. After Wednesday’s run I actually feel like I probably could, but I’m not quite ready to risk it. I’m looking at the Cherry Blossom 10 Miler next April as a good chance to race in them. 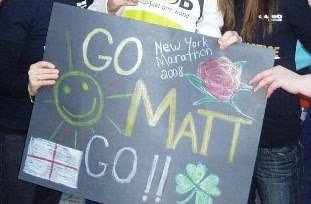 I’ll also be able to recount my stories of running the NY Marathon while wearing a Phillies cap (Go Phils!!!). My mom suggested I put my name on my shirt for the race, as lots of folks do at marathons. I told her I would pass as it would just give the Yankees fans a chance to personalize their insults to me as I ran by. So wish me luck! I’ll let you know how it goes! Welcome to Day 4, the last day of the first annual Boston Dessert Week. Take a moment to get sad...ok, now get happy! Because my final dessert post is about Oreo Cupcakes, and they're pretty amazing!!! These babies were Jess's inspiration, Jess's project, and Jess's great success. I can only claim to have overseen the frosting-making (and by "oversee" I mean I watched closely, and made sure my fingers were in the bowl and my tongue on the eggbeaters...). The cake is the Hershey's Perfectly Chocolate Chocolate Cake recipe from the Hershey's box, that by now everyone should know is the best chocolate cake recipe out there. Jess also put an Oreo in the bottom of each cupcake. And then to top things off, Oreo Frosting - Oh. My. God. So GOOOOOOD!!! We frosted them pre-dessert party (and post-run. Sidenote: I know I said I'd blog about my run - but really it was just a good workout with my old team. Nothing crazy, but everything that is good about college running). Anywho, it took A LOT of willpower for me not to OD on sugar right then and there. We started out frosting with a piping bag, but little chunks of Oreo kept clogging the tip...so we did the rest of the cupcakes with a knife. Directions: 1. In bowl of stand mixer, cream butter, vanilla, and water. 2. Add confectioner's sugar, meringue powder, and crushed Oreos. Mix until well combined. 3. At this point, your frosting will be very thick. To top cupcakes, it's better to have medium to thin consistency icing, so you'll have to add more water. I probably added another 2-3 tbsp. to get the desired consistency, but you'll want to add the water little by little to make sure you don't add too much. When it's the right consistency, it should be pretty easy to stir by hand (think about whether you'd be able to easily squeeze it out of a piping bag). If you accidentally make it too thin (runny), add more confectioner's sugar. Welcome to Day 2 of Boston Dessert Week. Get ready. Get set. Ta da! We did it. Just look at our Rainbow Cake!!! WOW, impressive right? This cake was a major group effort - I mean, a lot of anxiety went into making this cake as perfect as possible. The adventure started about two months ago, when I came across some unreal pictures on this blog. I want that! was all I could think. And my friends, Jess and Erin, felt the same. It immediately became their desktop wallpaper (Erin: "I seriously don't think I can look at this every day - it's killing me!") to tease them every time they opened their computers. So what would be a good occasion for a project of such magnitude? We pondered this for a bit, and the answer soon came clear: Jess's birthday/Boston Dessert Party!!! I will admit, along the way I had my doubts about the feasibility of this project. I mean, it's pretty complex. And I don't even like frosting that much, so the actual eating of the cake was not my goal...But now I can say that I have made a rainbow cake, and thoroughly document the adventure. Check. Yeah, that's right, be impressed. As far as recommending this recipe - I can't say the cake actually tasted that awesome. The frosting is ridiculously buttery, and the cake gets overpowered. We made the coconut cake, unlike the Whisk Kid recipe, but it didn't taste very coconutty in this context. If you're going for deliciousness, this is not really the cake for you. There are many more yummy recipes out there. BUT wow-factor-wise, well, just look at it! Nuf said. On Friday night, we made the cake. We didn't use cake flour...which retrospectively, I think was a mistake. There is a difference between cake flour and all-purpose flour, and it affects the ratios of your batter. We didn't use a scale to measure out our batter. We just divided it into bowls 1/4 cup at a time (so that they would be as even as possible). We used fancy food coloring, rather than your typical Easter-egg-dying variety, which I think was a good call. Because the layers are so thin, they only need to cook for about 15 minutes. Keep an eye on them! Luckily, I had a GENIUS idea. Like seriously, one of the best ideas I've ever had. Rather than continuing to ruin our cakes as they came out of their pans, and then trying to patch them back together, we started cutting them in half before taking them out of the pans! This enabled us to get a spatula under the most fragile center of the cake, and gently lift them out one half at a time. Then the two pieces could be put back together. When you frost the cake, no one can tell the difference! We then froze the layers overnight. This recipe recommends making the frosting in 2 batches, which we did. incorporated before adding the next. After all the butter has been added, turn the mixer back to high speed and whip until it has come together, about five minutes. Add the extract, beat briefly and then use. 2. Turn on your stove and heat the frosting over medium heat for like 20 seconds. 3. Return to the mixer and beat. This isn't supposed to happen (meaning, ideally the frosting would come together on its own), but it happened to us both times. Also, you could probably half the second batch of frosting - we had a lot left over. The frosting does spread very easily. And because our layers were frozen, it set very nicely. But make sure that you serve the cake at room temperature, otherwise the frosting will just feel like you're eating butter. Our cake was a masterpiece. Very impressive-looking. So if you decide to make one yourself - good luck! Let me know how it goes! 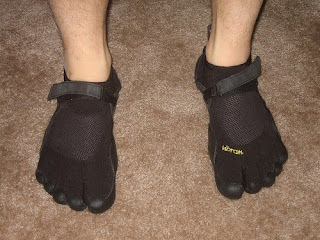 Back for a second go-round writing about my experiences using the Vibram Five Fingers (VFF). For those who missed last week, I’ll be using these shoes once a week on shorter runs while I train for the New York City Marathon. I’m hoping to incorporate them into my regular running routine once the race is over. This week’s run was the second time I’ve run in them. The feedback from last week’s entry was positive (granted, said feedback was mostly from friends and family who are too nice to tell me if it was awful). I was told it was a bit long so I’ll work on shortening the entries going forward. My genius plan to turn this into a layered historical narrative a la One Hundred Years of Solitude will have to wait for another forum…the magical realism stays though, critics be damned! My running schedule this week has been screwed up by a cold/flu. I came down with it Sunday, so didn’t get my twelve-miler in (Saturday’s soccer game in the cold and rain surely didn’t help). Monday wasn’t any better so I didn’t run then either. When I told my coach that I was sick and hadn’t done my long run, he very passive-aggressively mentioned that he was just getting over being sick but hadn’t missed a workout. Damn him. Feeling appropriately shamed, I dragged myself to the gym on Tuesday and decided to run as long as I felt I was up for. I generally hate running more than a few miles on a treadmill, but figured that with the illness I was better off indoors. I started at an 8 minute/mile pace but was dragging pretty badly. After two miles I dropped to about an 8:30 pace and made my way through 8 miles. I need to get better asap, because running the marathon like this would be awful, not to mention slow. On Wednesday evening I set out for my run in the VFFs. I still feel lousy, but was determined to go further than the three-mile run I did in them last week. My other goal was to test out the VFFs on some climbs and downhills, as last week’s route was pretty flat. I didn’t have a precise route in mind, but decided I’d run as long as this week’s episode of “The Bugle” podcast lasted (which turned out to be roughly 35 minutes). The right shoe didn’t feel quite as awkward as last week (but the pinkie toe still feels odd). Though it feels awkward when I’m just standing around or walking in the VFFs, running feels pretty normal. Once again, I quickly fell into a comfortable pace right away. I tried to be cognizant of my foot strike position to see if the VFFs really had me striking more on the ball of my foot. On the flat road I really didn’t notice a huge difference in how I was landing, but on the climbs I felt like I was using the balls of my feet more than I do in a standard running shoe. I can’t imagine that the change is that immediate, (this being just run #2), but the idea is that I’ll gradually notice changes in how my feet land, and I’ll be landing softer. The terrain for this run was mainly pavement, asphalt, and some hard-packed dirt. The shoe felt natural on all the surfaces, but I find that I’m constantly reminded of the fact that I’m a wearing a weird barefoot shoe because of the different feel when I land each step. This isn’t a good or bad thing. It’s just a different feeling, but maybe I won’t notice that as much the more I run in them. On one of the uphills I wasn’t paying attention and landed on a decent sized rock. It didn’t hurt, but definitely felt uncomfortable and kept me alert the rest of the run.